For the Hainanese people, see Hainan people. Bible in Hainan Romanised (Genesis), published by the Bible Society of Great Britain. Hainanese (Hainan Romanised: Hái-nâm-oe, simplified Chinese: 海南话; traditional Chinese: 海南話; pinyin: Hǎinán huà), also known as Qióng Wén (simplified Chinese: 琼文; traditional Chinese: 瓊文) or Qióng yǔ (瓊語/琼语), is a group of Min Chinese varieties spoken in the southern Chinese island province of Hainan. In the classification of Yuan Jiahua, it was included in the Southern Min group, though is mutually unintelligible with Southern Min varieties such as Teochew and Hokkien–Taiwanese. In the classification of Li Rong, used by the Language Atlas of China, it was treated as a separate Min subgroup. It is sometimes combined with Leizhou Min, spoken on the neighboring mainland Leizhou Peninsula, in a Qiong–Lei group. 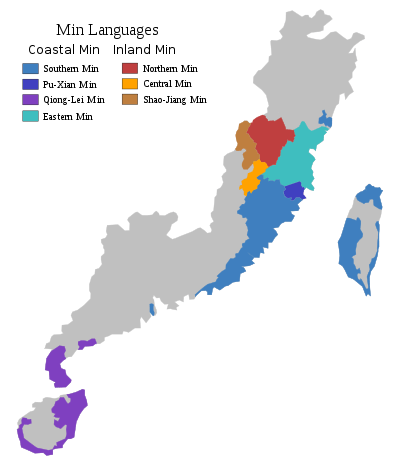 "Hainanese" is also used for the language of the Li people living in Hainan, but generally refers to Min varieties spoken in Hainan. Hainanese has a simple vowel system . Hainanese notably has a series of implosive consonants, which it acquired through contact with surrounding languages, probably Hlai. The phonological system of Hainanese corresponds well with that of Hokkien, but it has had some restructuring. In particular, etymological *anterior plain stops have undergone implosivization (*p > [ɓ], *t > [ɗ], etymological *aspirated stops have spirantized (*pʰ > [f], *tʰ > [h], *cʰ > [ɕ] *kʰ > [x]), and etymological *s have hardened into stops (*s > [t]), and *h > [f]. Additionally, some dialects have [ɡ], and [ʑ] is allophonic with /j/. ↑ Hammarström, Harald; Forkel, Robert; Haspelmath, Martin; Bank, Sebastian, eds. (2016). "Hainanese". Glottolog 2.7. Jena: Max Planck Institute for the Science of Human History. ↑ Hammarström, Harald; Forkel, Robert; Haspelmath, Martin; Bank, Sebastian, eds. (2016). "Hainan". Glottolog 2.7. Jena: Max Planck Institute for the Science of Human History. ↑ Kurpaska, Maria (2010). Chinese Language(s): A Look Through the Prism of "The Great Dictionary of Modern Chinese Dialects". Walter de Gruyter. pp. 54–55, 86. ISBN 978-3-11-021914-2. Chang, Kuang-yu (1986). Comparative Min phonology (PhD thesis). University of California, Berkeley. Chen, Hongmai (1996). Hǎikǒu fāngyán cídiǎn 海口方言詞典 [Haikou dialect dictionary]. Great Dictionary of Modern Chinese Dialects. 16. Nanjing: Jiangsu Education Press. ISBN 978-7-5343-2886-2. Huang, Karen. "Contact-induced changes in the languages of Hainan". Annual Student Conference of the College of Languages, Linguistics, and Literature. University of Hawaii. Kwok, Bit-chee (2006). "The role of language strata in language evolution: three Hainan Min dialects". Journal of Chinese Linguistics. 34 (2): 201–291. JSTOR 23754124. Norman, Jerry Lee (1969). The Kienyang Dialect of Fukien (PhD thesis). University of California, Berkeley. includes a description of the phonology of the Ding'an dialect. Solnit, David B. (1982). "Linguistic Contact in Ancient South China: The Case of Hainan Chinese, Be, and Vietnamese". Proceedings of the Eighth Annual Meeting of the Berkeley Linguistics Society. 8: 219–230. doi:10.3765/bls.v8i0.2041. Woon, Wee-Lee (1979a). "A synchronic phonology of Hainan dialect: Part I". Journal of Chinese Linguistics. 7 (1): 65–100. JSTOR 23753034. describes Wenchang dialect. Woon, Wee-Lee (1979b). "A synchronic phonology of Hainan dialect: Part II". Journal of Chinese Linguistics. 7 (2): 268–302. JSTOR 23752923. Wikimedia Commons has media related to Hainan language.